The Great Lakes ADA Center now offers self paced webinars approved for Continuing Education Credits. The following sessions have been approved for 1.5 contact hours for AIA and Great Lakes ADA Center’s Certificate of Attendance. Due to the verification process, the criteria to earn Continuing Education credit requires that you view the entire webinar in addition to completing the Pre- and Post-Test in one continuous sitting. If you stop at anytime, whether during the video or in a test, you must start the process again. Please click on the session you would like to watch for continuing education credit. Accessible routes are a key component of accessibility for people with disabilities. They ensure accessible circulation throughout sites and facilities and access to various elements and spaces. This session will review components of accessible routes in the ADA and ABA Accessibility Guidelines, including walking surfaces, doors, ramps, curb ramps, elevators, and other means of vertical access. Access to toilet and bathing facilities is the subject of many technical inquiries received by the Board. This session will review scoping and technical requirements for toilet and bathrooms. Illustrations and diagrams will be used to explain how various specifications apply and relate, including those for clear floor space, required clearances and fixtures and doors, and turning space. 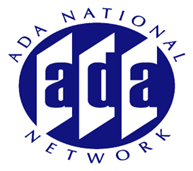 Doors are required to be accessible in nearly every building and facility covered by the 2010 ADA Standard or the Architectural Barriers Act Accessibility Standard. This session will review in detail the maneuvering clearances for accessible doors using images and animations to better explain the rationale behind these provisions. Other provisions that address criteria for recessed doors, automatic doors, doors in a series, and door hardware are among the topics to be covered in this session. Please check back for additional sessions to be added periodically to this series.